Porsche takes their iconic 911 to new heights. 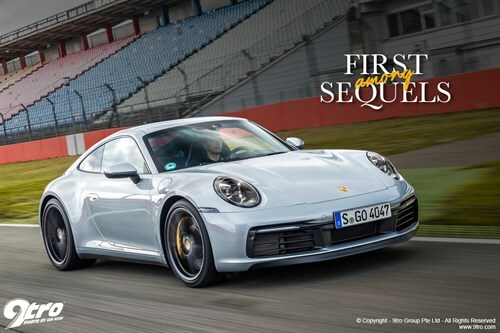 Each generation of Porsche’s rear-engine 911 has earned praise for the progress made over its predecessor, with reviewers sometimes noting how hard it would be to make the new car any better. Yet Porsche continues to raise the bar, so here we are again saying this about the 992, the eighth generation 911. The 911 Carrera bodywork choices are simpler this time round; wide body or wide body. To put this in perspective, while the Targa body style was added to the Coupe in 1967, with the Cabriolet following in 1983, the option of normal or Turbo look on models all but the Targa began with the Carrera 3.2, and rear or four-wheel-drive with the 964 that succeeded it. However, the keen take-up of the Turbo width option, not to mention its use by the GT, GT RS and R models, means that rationalisation to make the latest 911 in just the 40mm wider form makes perfect economic sense. Apart from reduced tooling costs and simpler production the 992 also benefits from better driving dynamics and a more purposeful stance across the board. This more aggressive stance is aided and abetted by rear wheels an inch larger in diameter than the fronts. First seen on the 918 Spyder, the use of 21-inch rear wheels with 20-inch fronts is a visual trick to rebalance the tendency for the wider rear wheel arches to make same diameter wheels appear smaller. The new tail treatment is distinguished by its thin full width lighting strip, which is a design cue worn by every current Porsche model. The active rear wing is now an integral part of the rear bodywork. Aerodynamically this is a more satisfactory solution, since it is further back and full width when deployed. The twin vertically aligned high level brake lights on the vertical bars of the engine bay grille are also unique and distinctive. Slightly larger car all round, the 992 is also 50kg heavier overall than the 991.2. But this is not a structural issue since the greater use of aluminium has actually reduced the weight of the body-in-white by 20kg. The devil is in the additional comfort features, driver aid systems, and the exhaust particulate filter required by the latest EU emissions regulations. Porsche 992 First Ride - First Among Sequels19 Dec 2018Even from the passenger seat the Porsche 992 impresses. 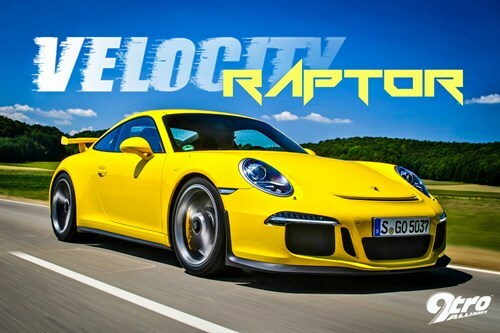 Porsche 991 GT3 – Velocity Raptor29 Jul 2013It might look like a street racer, but the fastest GT3 ever is also civilised. The 992’s instrument pack is a landmark in the annuls of 911 history, Porsche finally ditching the analogue instrument pack in favour of electronic displays. However, the big rev counter remains the analogue centrepiece, and is all that remains when you switch off the ignition and the readouts on either side go dark. “The dashboard has reverted to the horizontal layout of the early 911s as opposed to the 996/997 era where the centre console and a sat-nav screen made the centre of the dashboard more vertical,” says Peter Varga, Head of Exterior Design for the 911. The new 10.9-inch widescreen display is pretty intuitive to use, and we like the quality feel and precision of the five shortcut switches positioned under the screen. We also like the big, clear “M” for Manual button behind the small transmission lever that locks the transmission in the ratio you choose with the paddle shifter. This is important as the PDK gearbox software will otherwise automatically shift up or down even in Sport Plus mode. The seats in our two test cars were of the same style, but one had full leather while the other fabric centre panels. Both proved equally comfortable, but there is no doubt that fabric is warmer in winter and cooler in summer, and it holds you better on track. At 1,515kg the new 992 Carrera 2S (Carrera 4S, 1,565kg), is almost double the weight of the original 130hp, 2.0 litre 911 of 1964. And with 450hp on tap it is exactly 50% more potent than the 930 Turbo of 1978. Bigger turbochargers mean more turbo lag, right? Normally yes, but the Porsche engineers have to all intents and purposes banished turbo lag from their 9A2 Evo 2,981cc flat-six motor. Whether you demand instant thrust to rocket away from the lights, engage in a rapid overtake, or simply come back on the throttle after lifting off this engine has all its bases covered. The repositioning of more efficient intercoolers along with perfectly matched sizing of the larger turbines and impellers in the uprated turbochargers has done a lot to both increase airflow and reduce backpressure. Meanwhile, the brand new eight-speed PDK twin-clutch transmission is the perfect partner for this lusty forced aspirated engine. Its closely stacked gears provide a gear for every occasion, and where each ratio ends the next instantly takes over to keep the torque-rich motor on the boil. The tall eighth ratio makes for relaxed highway cruising, and with 120km/h corresponding to around 1,600rpm for instance, a tank of fuel goes even further than before. A manual gearbox will be along in a few months as the entry-level transmission. With 530Nm of torque peaking at just 2,300rpm and maintained all the way to 5,000rpm, the 9A2 Evo flat six punches hard low down but also keenly revs out to 7,500rpm with all 450 horses present and accounted for at 6,500rpm. A strong low-end punch and a soaring, feral top end delivers the best of both worlds, and makes for impressive flexibility with no loss of the distinctive flat six character. Around town you can treat the 992 like a normal car and amble along riding the stout torque curve, or punch it hard on the open road and get real supercar performance in reply. The 911 Carrera’s performance repertoire has never been broader. The stopwatch numbers are impressive too. Thanks to its perfect traction the 4WD Carrera 4S with Sport Chrono Package leaps off the line to hit 100km/h (62mph) in just 3.4 (C2 3.5 sec) seconds. But after that the extra weight and frictional losses of the 4WD system take their toll, and 160km/h (100mph) comes up in 8.0 sec (C2 7.8 sec), and 200km/h (124mph) reached in 12.7 sec (C2 12.4 sec). The C4’s 306km/h (190mph) (C2 308km/h/191mph) Vmax is also slightly lower. I drove the Carrera 2S on the road and wet handling course, and the Carrera 4S on track, and their perceptible differences were exactly as I had surmised, but with an added twist or two thrown in. The 911 has always gained a significant traction advantage from having its engine over the rear wheels, and in the old days, spinning the wheels of a naturally aspirated 2WD 911 on bone dry tarmac was a pretty tall order without being brutal with the clutch. 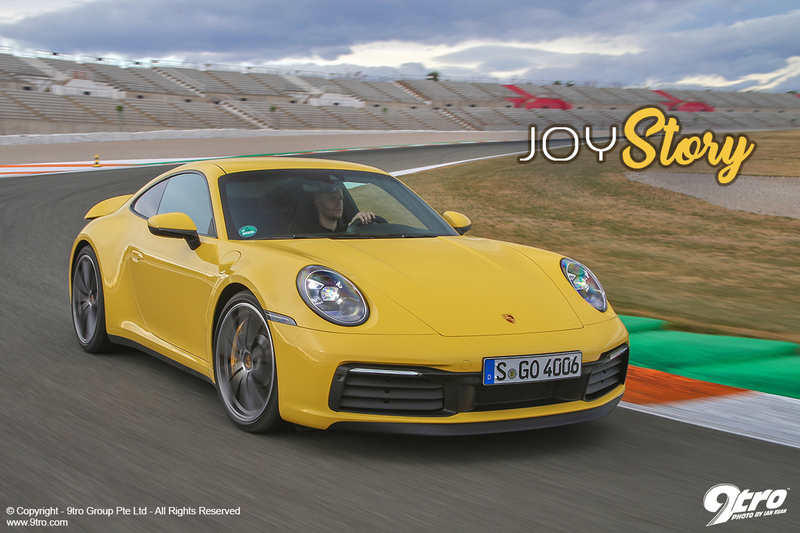 Now, despite its massive 11.5J x 21-inch rear wheels shod with 305/30ZR21 Pirelli spec rubber the latest Carrera 2S will even wiggle its hips in second gear under hard acceleration in a straight line on a dry road. You can thank the huge slug of turbocharged torque for this, and it helps to make the rear-driven car more playful for the keen driver. I was also pleased to find that the latest electronic control suite has been honed to make Sport Plus useable on the road without reservations. In 997 days this setting was far too edgy for road use, triggering downshifts at the slightest provocation. It only came into its own on track where you are either hard on the throttle or hard on the brakes. This latest incarnation of Sport Plus has been to finishing school and graduated with a far more even-handed personality that no longer forces aggressive downshifts when you slow down on part throttle. Yet the engine, transmission and active damping are no less sharp when rising to the occasion on a challenging road. A key feature of the revised suspension is the new generation of active dampers developed in co-operation with Bilstein. Despite the big, ultra low profile tires, the ride is absorbent and comfortable for a sports car, yet body control is impeccable even when you step up the pace in Comfort mode. Individual allows you to programme in personal preferences like Sport for the engine and gearbox and Comfort for the damping, a combination most people find engaging yet comfortable for daily road use. As you would expect of a sports car with big tyres the 992 is not going to challenge a limo for low rolling noise. But apart from on particularly rough tarmac the tyre noise is typical for this class of car, and is not a major component in the ambient noise spectrum on smooth tarmac. On the subject of sound, we were wondering what effect the new EU mandatory particulate emissions filter would have on the exhaust signature. As two Carreras and one GT3 RS pace car went past us on full chat on every lap session it was very clear that the Carrera has a deeper chested flat six soundtrack when compared to the screaming naturally aspirated GT3 RS. The good news is that the engine noise that reaches the cabin is a fine mix of flat six sounds from the air and water-cooled 911 ‘archives’ overlaid by some unique new induction and exhaust keynotes. I am sure 911 buffs will approve. Right from the first bend on the very technical Circuito Ricardo Tormo near Valencia it was clear that the 992 is something special. In fact it would have to be since we had to keep up with the GT3 RS pace car pedalled by one of Porsche’s pro instructors at the helm. Helped by the rear axle steering the front end is very pointy, especially under trail braking and you feel the really good grip the moment you turn in and load the front tyres. The wider track and new engine mounts reduce weight transfer and the lack of unsettling weight transfer makes the car feel really stable through a turn. The confidence window is simply huge. Whatever you might say about turbocharged motors there is no question that their superior swell of low-end torque makes for a faster exit speed from a given bend, traction permitting. Good traction is a traditional 911 strength that comes from its rear-engine configuration, and with four-wheel-drive as icing on the cake, the Carrera 4S is formidable on both road and track. From the get go the GT3 RS pace car could not get away. It would take a circuit with long fast sweepers like the Nürburgring for the GT3 RS to use its aero downforce and 50hp top end to advantage, but Ricardo Tormo is not such a track. The 991.2 GT3 RS has 500hp at a screaming 8,250rpm and 460Nm of torque at 6,000rpm. And it weighs about 140kg less than the Carrera 4S I was driving. However, the greater low down punch of its twin-turbo motor and 4WD take a big bite out of those advantages allowing the 992 Carrera 4S to hold its own. And as our test cars were also fitted with PCCB brakes, the only significant advantage the GT3 RS had was its stickier Michelin Cup tires. The video footage taken by the new Porsche Track App shows just how closely we were able to follow the GT3 RS, whose driver later admitted that he was not far off the limit at the end of our session. For the record, we posted a fraction over 1:55 min after three laps. Porsche told us that nine-time F1 winner Mark Webber had been there a few days before to try the Carrera 2S. He recorded 1:48 min on his first lap, and went on to stop the clock at 1:45 min. The Track App video of his lap showed his banzai lap, which in typical F1 style involved using every inch of the painted kerbs and sometimes more to minimise his steering angle through each bend. A big eye opener was the lateral g force element of the Track App recording a momentary 1.6g in one corner of Mark’s lap. This is an indication of just how good the latest Porsche specification Pirelli street tyres are. And like the awesome PCCB ceramic brakes the new Pirellis seem unfazed by track work, maintaining the 992’s crisp handling lap after lap. One debate that enthusiasts have been having since the 964 Carrera 4 appeared in 1989 is the purity of steering feel versus the rear-driven car. This issue has only become more heated since the advent of electric power steering on the 991. First things first, and Porsche’s electric power steering is no better or worse than its hydraulic system, and that is as good as it gets this side of the Cayman GT4. The steering of the 992 Carrera 2S is a fraction purer and more tactile steering than the 4S, as well as a touch lighter, but this is a matter of degree. Given a choice I would take the Carrera 4S for its towering abilities as a 365 day daily driver, and the more playful Carrera 2S for the track. The act of selecting Wet Mode is a driver choice, an important factor in an enthusiasts’ car like the 911. The prompt that asks the driver in the first instance is connected to sensors at the back of the front wheel arch housings tuned to the distinctive sounds of water and snow being thrown up by the tyres. The rationale behind this is that the rain sensor only detects drops of water on the front windscreen when it is raining, but not when the ground is wet or covered in snow. Porsche provided a sprinkler equipped wet handling course next to the racetrack, and it was very clear from doing a couple of laps in Sport Mode and then Wet Mode just how effective the system is at keeping you from a big whoops! Applying throttle exiting a bend in Sport Mode saw the back end step out instantly, requiring an armful of opposite lock to catch. Fine for an experienced driver on track but heart stopping for a normal one, and not nice for anyone on a dark, wet night on an unfamiliar road. With Wet Mode engaged the scenario was quite different, the softer throttle response reigning in the build-up of torque, with slip detected and neatly contained before a big oversteer moment could develop. The system works fairly unobtrusively, gently bringing the car back into line when mechanical grip is lost. It is quite unlike the ‘hard cut’ you normally experience when ESP jumps in to save you from the laws of physics. The huge advances in chassis, engine, transmission, aerodynamics, and electronic driver aids make the 992 Carrera significantly faster and more comfortable than its immediate predecessor, as well as some of the past super sportscars from Porsche’s own stable. With an official 7:25 min Nürburgring lap time under its belt, the 992 Carrera is 7.0 sec faster than the Carrera GT of 2004, and equals the 991 GT3 of 2015! The counterpoint is that the new Carrera 2S and 4S are dynamically the most versatile 911s ever, the new active damping improving everyday comfort at the other end of the spectrum. In addition you can now have every driver aid offered on other Porsche models barring the Head-up display. There is a distinct advantage in being able to continuously hone a design for 55 years compared to starting with a clean sheet of paper every time. The new 992 Carrera maintains this tradition of continuous evolution, and in so doing raises the bar even higher for any would be challenger.